The last time we saw the multi-disciplined talents of Aggressive on our pages, it was with their disquieting tale of wolves and regret. They return today with a project of a significantly different colour, one in which the technological beauty of flight takes awe inspiring centre stage. 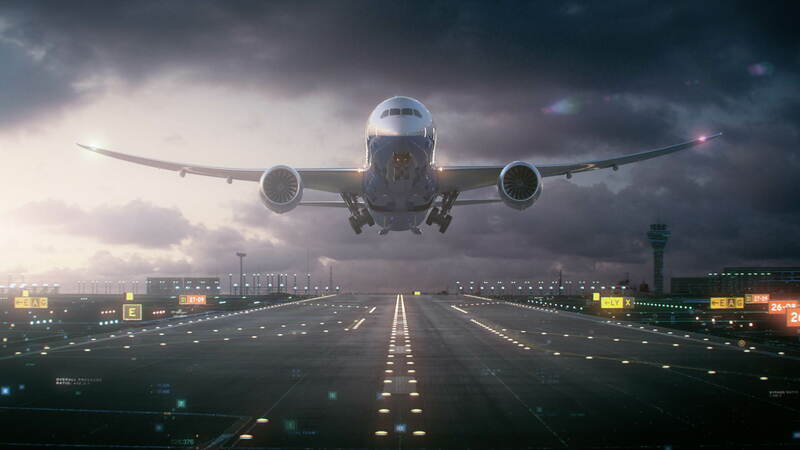 Commissioned to create a series of ads to celebrate Boeing’s 100th anniversary, Aggressive have crafted a trio of films which see the complex designs of Boeing’s engineers resolve before our eyes into the gravity defying machines that have helped shape our modern world. We invited Aggressive tell DN how they approached the task of honouring the past whilst looking to the future of this century old aeronautics pioneer in gloriously kinetic CG animation. As a celebration of 100 years of Boeing what was the brief Aggressive was tasked with? We were tasked with crafting 3 spots to celebrate the Boeing 100th anniversary, building each spot around Boeing’s rich history in space, defense and commercial travel. The overarching concept was to visualize that awe-inspiring process that starts with a single spark in the mind of a Boeing engineer, and finishes with a gravity defying roar of an engine taking a machine to unprecedented altitudes. From historic to future Boeing products – these are the concepts that won wars, brought continents together, propelled us to new frontiers, and changed every aspect of our modern world. What was your creative and technical approach to developing these spots? Our approach was to visualize Boeing history as a precise, engineering environment. At first two-dimensional, our world gains in complexity and volume as the aircrafts quickly assemble, materializing from blueprint lines into real-world machines. Each spot resolves with the blueprint lines crafting a schematic ‘launch scene’ for our now photo real aircraft – a runway, an aircraft carrier, a launch pad and so forth. From the historical, 1916 B&W plane to the 787 Dreamliner, Boeing products come alive, celebrating 100 years of technological triumphs. We chose a darker, stylized color-scheme to allow for a variety of data, sparks, engine and rocket glows, when showing the aircrafts assembling and coming together. Using seamless design and ultra-real CG animation, we drew inspiration from blueprints of aircraft engineers. Each spot begins with a single spark, a beam of light, traveling across a blueprint surface. Our camera glides alongside this linear ‘idea in motion’, as it unfolds into schematic designs of the various historic Boeing products. As the blueprint light-lines expand and multiply, the designs of the aircrafts they trace become increasingly detailed. What started as a simple outline of a fuselage, becomes a finished blueprint in a matter of seconds, until they finally break the two-dimensional barrier and become real-world machines. How long did the spots take to complete and what was in the Aggressive toolkit? We used 3D Studio Max, After Effects, Houdini. The project took around 5 months from start to finish, a good portion of that time was spent on approving the aircraft models with the engineers to make sure we were true to reality, even without access to the blueprints. Despite their brief running times the spots contain a high density of visual information. Technically how did you balance a desire to show more with considerations of resources and timescale? That’s exactly what guided us – timeframe and resources. But it was also interesting in a sense that Boeing would disclose only so much when it came to some of their aircraft. They obviously couldn’t really provide us with their proprietary engineering blueprints, and when it came down to modeling the current military and space products, things got even more secretive as one would expect. Alongside the visuals the films also sport richly layered soundtracks placing us in the centre of the unfolding action – how tied were the sounds we hear to the multitude of individual components that form the vehicles? We started with a very strong vision of the sound design even before animation kicked off. We really wanted the viewer to ‘hear’ the factories and the Boeing construction process, as the digital elements came together on screen. We feel like it worked out nicely, really grounding the spots. What in particular about this project represents the flourishes or hallmarks of Aggressive? As always, we love to mix and match our varied backgrounds and disciplines, all under Aggressive’s roof. This project allowed us to build on our strengths in design, animation and VFX, as well as our music video careers – to craft three extremely visual, dynamic, sound driven pieces. What will we see next from Aggressive? All kinds of stuff – from new shorts to commercials. For example we just wrapped a shoot out in Shanghai, China for Huawei, where we built this gigantic 60’ x 20’ ft LED room, with dynamic animated lighting on walls, ceiling and floors…. It’s pretty incredible. We’ll be sure to share once it’s done!